I was terrified recently (I believe it was the fourth of this month) when war broke out. You must have heard the exploding artillery and seen urchin bodies bursting in air. What was the urchin skirmish about? During the warfare I mostly panicked, paced, and shook but in between I snuck a glance at the night sky so I know they were urchins. Were they blasted out of the water by cannon? I can say that there were no survivors because the urchins disappeared almost as fast as they appeared, with more urchins appearing, then disappearing. At least the mêlée was of short duration. Worried I had witnessed an urchin apocalypse, the next morning I dunked myself into the drink and was relieved to see some urchins adorned in their crimson glory. 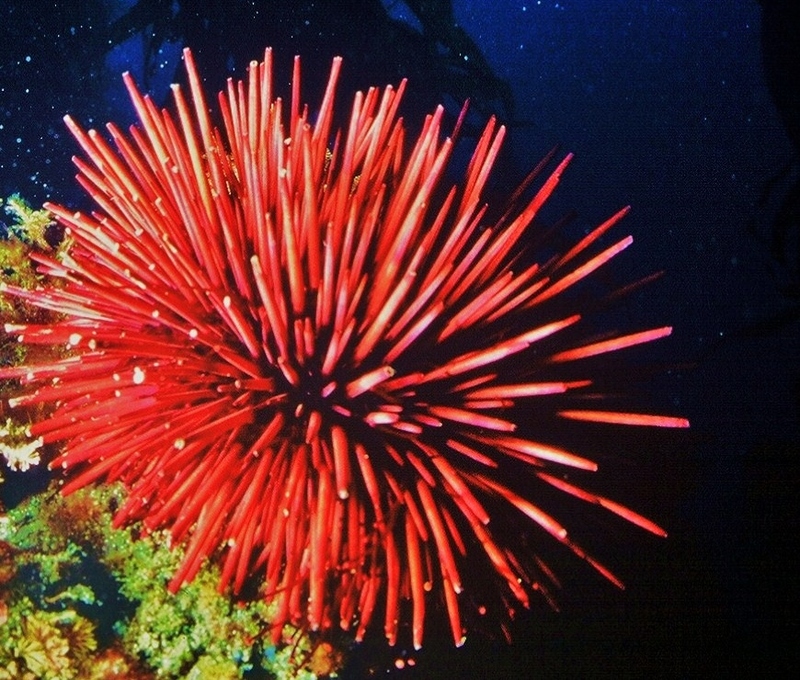 Urchins come in many colors but red is my favorite. I’ve always felt simpatico with urchins, not just because they are shaped like a tennis ball but because we share the drive to chew. It’s a doggone shame we can’t hang out together, me needing to breathe air and all, because I could pick up a few tips on gnawing. Actually, that’s a pipe dream because I can only drool with envy over an urchin’s dental talents. They can literally grind through stone. Sure, it wrecks their teeth but it’s not a deal breaker. Let’s just say that if you had urchin teeth, dentists would have to find other things to drill and denture-makers would have to find other things to impress. You see, not only are urchin choppers constantly growing, they are self-sharpening. Urchin pearly whites fit together as plates instead of incisor-molar arrangements. And each urchin tooth is a montage of two calcite crystal shapes. (Since lots of rocks are made up of mostly calcite, it seems fair to say that urchin teeth are practically rock themselves.) The two crystal types lie crosswise to each other and are glued together with a magical super-strong cement you won’t find at Home Depot. Between the hard crystals and super-dooper glue are layers of a weaker material that break from all the grinding. Think of the breakable areas like dog treat coupons you can neatly remove if you tear along the dotted-line perf orations. Thus, the damaged ends break off along the fault lines while leaving the crux of the tooth intact. As the teeth keep growing, the old worn-out or broken parts are jettisoned and, voila, an edge as polished and honed as a Samurai’s sword. It’s a tad unfair that urchins get to have teeth with super powers, seeing as how they are vegetarians. I have to keep reminding myself that the point of urchin toothiness isn’t about hunting prey but avoiding becoming prey. 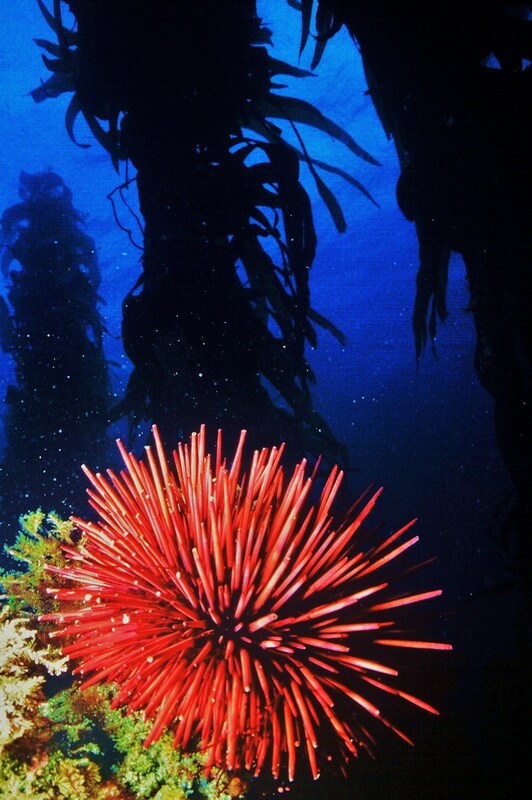 By boring through and carving out nooks in rock, urchins protect themselves from waves and predators. Imagine what it would be like if I had an urchin’s dental gifts. Yeah, I know. Those of you parents to children with fur are shuddering right about now. Maybe my dental dreams will become a reality for my distant furry relations. After all, we are all still evolving. The canine family sapling was planted only 60 million years ago. Since urchins rolled into being over 200 million years ago, they’ve had more time to perfect their perfect bite. And, of course, they’ve done a heck of a job on the survival front. Just look at their can-do attitude in the face of their recent brutal though brief battle. No one can accuse them of being spineless. 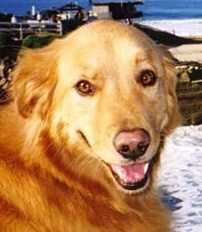 Sydney the Golden Seal is a retriever-husky who has logged miles of ocean swims. She writes her column, “Sydney’s Ocean Log,” about the wonders of our watery world. When not dog paddling or opining, Sydney pursues archaeology research in her backyard. Write to Sydney using the Contact page, and put Sydney the Golden Seal in the Subject line.